Runs were plentiful for Notre Dame on Wednesday as the No. 24 Irish beat Toledo by a score of 11-1 in five innings. 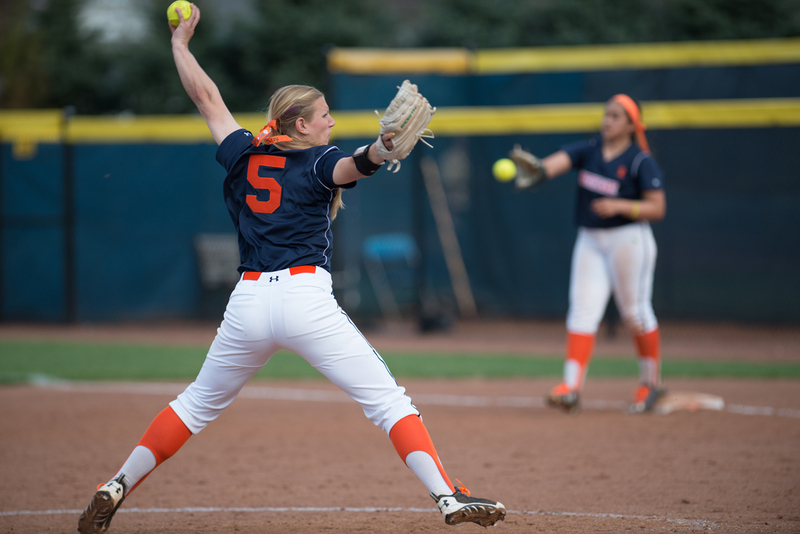 Junior pitcher Allie Rhodes winds up against Syracuse at Melissa Cook Stadium on Saturday. After a win last night, Rhodes is now 17-4. Pitching for the Irish (38-11, 16-5 ACC) was junior left-hander Allie Rhodes. Rhodes allowed the Rockets (38-11, 16-5 ACC) to jump out to an early 1-0 lead in the first inning, but she was solid from then on, allowing only three hits and recording three strikeouts. Irish head coach Deanna Gumpf said Rhodes did a good job of not being rattled after allowing an early lead. Behind Rhodes’ performance, the Irish notched four runs in the third inning and seven runs in the fourth inning after being held scoreless in the first two innings. Gumpf said the momentum change from the first two innings to the third and fourth innings was big for her team. In the third, senior infielder Jenna Simon singled and stole second, then scored off a single from sophomore outfielder Karley Wester. Wester was driven home by a towering double from senior infielder Katey Haus, and junior infielder Micaela Arizmendi cleared the bases with a home run to center field. In the fourth, junior catcher Casey Africano and freshman infielder Morgan Reed got on base to start the inning. The next batter, junior outfielder Megan Sorlie, hit a double to send home Africano and Reed. Sorlie scored on an error by the Rockets on a throw to second base. Toledo changed pitchers in the middle of the inning, but it did not help as the Irish closed the inning with three two-run home runs from Wester, Arizmendi and freshman infielder Sara White. Gumpf said the key to the big fourth inning for the Irish was keeping it simple when hitting. Gumpf said she liked the diversity of her offense, which tallied eight runs from home runs and three runs from singles and stolen bases. With the win, the Irish extend their win streak to 24 games as they get ready to take on North Carolina in a three-game series this weekend. Notre Dame is currently third in the ACC, while the Tar Heels are second. The two teams will play a doubleheader Saturday starting at 1 p.m., and the series will finish with a game Sunday at noon at Melissa Cook Stadium.